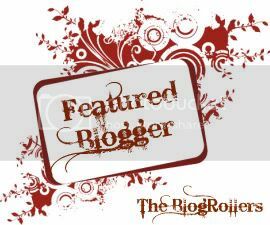 d...to bring you news that I am the Feature Friday Blogger today at The BlogRollers’! Christie and Lorraine, the dynamic social media duo behind The BlogRollers, are all about leveraging the power of the female blogger. I recommend you subscribe to their blog or RSS feed. Now go read my feature, leave comment love, and sign the BlogRollers' blogroll so you can be in the running to be highlighted next. *postscript: The BlogRollers are asking everyone for prayers and support for fellow blogger Anissa and her family. Congrats! Thanks for the dance workout too :) Happy Friday! cool beans! I'll head over and check that out! And congrats on your big day! Thansk for swinging by my place and following. I will be following you too. I have not heard of blogrollers..so I am excited to find something new. THANKS! No one is watching so I did my dance. Congratulations girl! You deserve it! Sweet! I love community opportunities like this! Hi! you are my SITS Saturday Sharefest buddy, and it looks like you had a really great TGIF this week! I'm off to check out your featured post. Congrats on being featured! I love this blog, it's wonderful!!!! Fabulous and so very well done! I'ts 5.43am and I actually did the little dance, bobbed my head, snapped my fingers and did the Shakira Shimmy, (well, my version of it!!!!) and guess what? It's actually set me up for the day . . . love it!!! Big big hugs to cutie pie Marlie and have yourself a lovely Sunday!!! !